Since vmware is not working anymore, it's been a long time for waiting VirtualBox in FreeBSD! problems but generally it works very well. 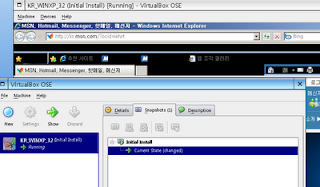 I am using virtualbox-2.2.51.r20457_3. As you can see, IE8 menu looks broken but I don't know why. It may be related to graphics engine but I can see Youtube HD movies without problem. Thanks for hard job, ports people!